With so much in the national news these days, there has been little said about the violence that continues to plague Nicaragua. At present, the country remains paralyzed following the recent failure of talks negotiated by the Catholic Church between the government of Daniel Ortega and protesters. To date, 83 people have been killed in violent clashes, the vast majority of whom are youth and university students. In the city of Masaya, where the United Brethren in Christ are headquartered, protests, looting and violence continue day and night. Masaya has symbolic significance to Nicaraguans, as it was here, 40 years ago, that the Sandinista National Liberation Front, launched a fearless and violent uprising against dictator Anastasio Somoza and troops loyal to him, which later plunged the country into a near civil war. We received an email from the United Brethren national leader, Rev. Armando Lopez (right), who lives in Masaya. He said mortar fire has destroyed the roof of the Aposento Alto UB church and parsonage. Stores have been looted, barricades block traffic, government buildings have been burnt to the ground, and what food is available is extremely expensive. Throughout the country businesses, schools, and factories are on lock down. Rev. Lopez is asking for our financial assistance so that they can provide food packets for the most needy in their communities and materials to repair the damage at the Aposento Alto Church. He believes they can repair the church and parsonage for about $500. We’re hoping to raise another $1500 to help them provide 100 families with packets of food. 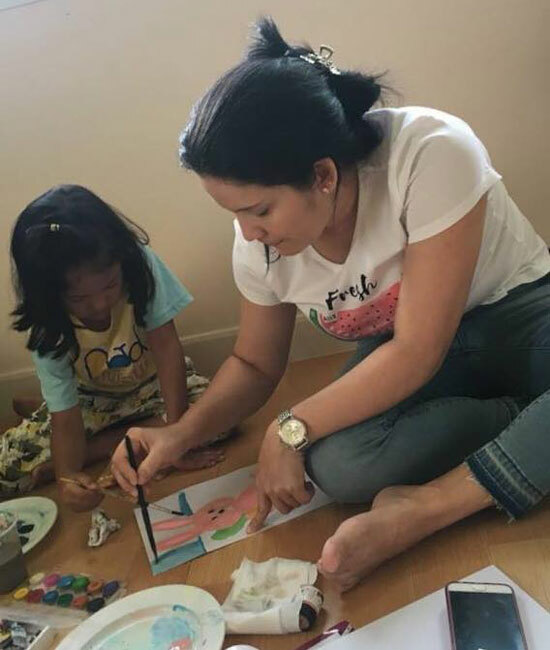 UB missionary Erika Pacheco painting with a Thai youngster. 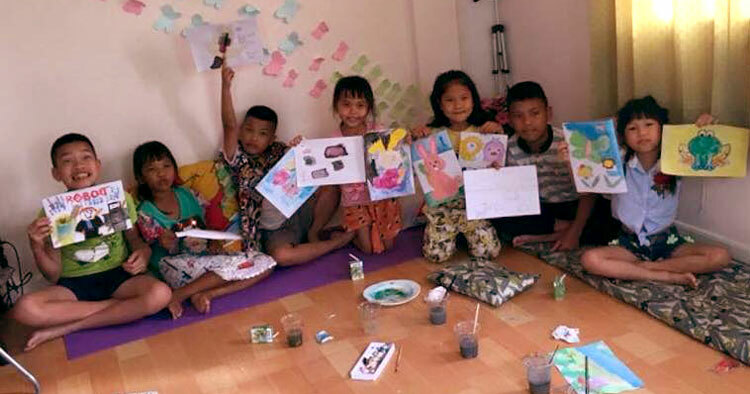 Thai children proudly display their painted creations. Our team of missionaries in Chiang Rai continue building relationships with neighbors in an effort to gain their trust and establish rapport. One of many ways they have been doing this is by having children in to paint pictures. Looking at these photos makes us wonder which of these children might be the first to become a follower of Jesus, or perhaps even a leader of the church in Thailand. Does your church have an activity or special skill they could pass on to the team? Perhaps you could even travel to Thailand to share your talents. Contact UB Global us if you have some ideas. 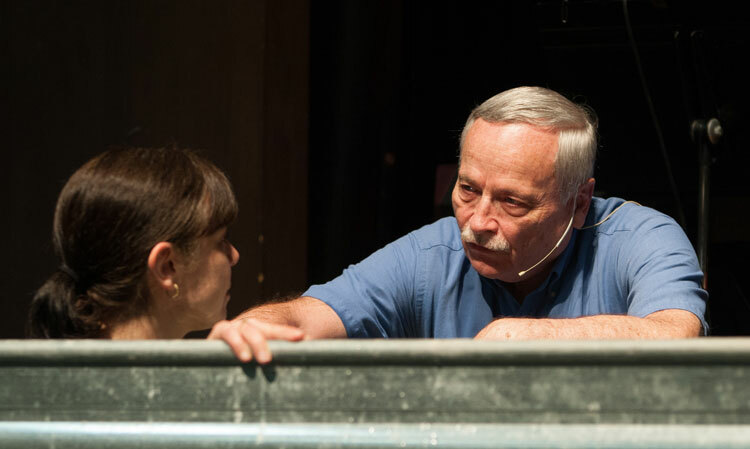 Lester Smith prepares to baptize a young woman. Pastor Smith leads a young girl into the baptistery. As previously noted, Lester Smith is retiring on June 1 after 38 years of United Brethren ministry. On May 20, as he prepared to conclude 20 years as pastor of Hillsdale UB church–or the HUB, as they call it–Pastor Smith baptized eight persons. Bishop Todd Fetters preached to the congregation that morning and prayed for the new pastor, Josh Good. I imagine this will be the last time you will be receiving any submissions from me. 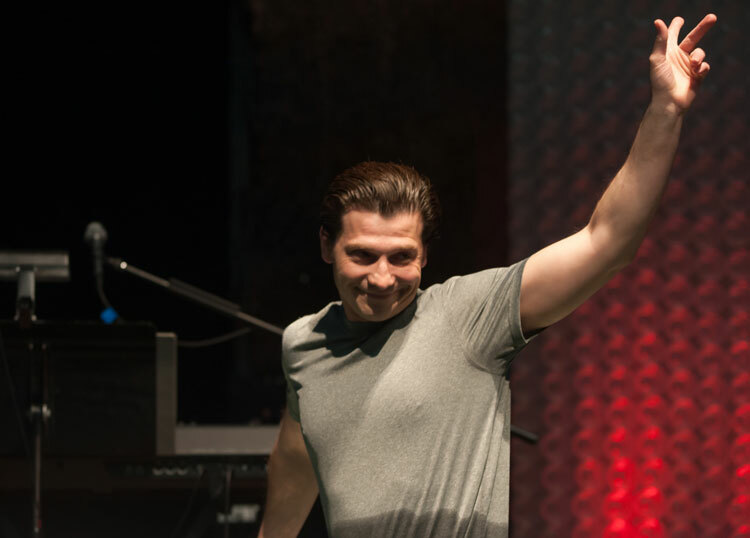 These are pics of the 8 baptisms we performed at my last HUB Service on May 20th. The Bishop delivered a great challenge to our congregation on praying for our new pastor, Josh Good. The guy waving his arm from the baptistry tank is the mayor of Hillsdale. Richard Neal Brinneman, 83, a longtime United Brethren endorsed missionary, passed away Saturday, May 26, 2018, after several days in hospice care. Neal, a 1957 Huntington University graduate, spent 1966-1969 as a teacher and principal at Bumpe High School in Sierra Leone. In 1970 he joined Wycliffe Bible Translators and went to Togo to begin translating the Bible into the Lama language spoken by 200,000 people in West Africa. Meanwhile Carol, a graduate of Houghton College, joined Wycliffe in 1970 and ended up spending seven years translating the Bible for the Godie people in Ivory Coast, a West African country to the west of Togo. Neal and Carol were married in 1979 in Ivory Coast, and worked together in Togo. They helped complete the Lama New Testament in 1994, and then moved to North Carolina to work with JAARS, the aviation and technical support service of Wycliffe. 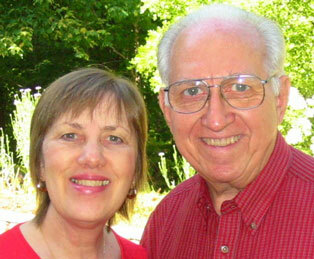 Neal helped translators with computer and software needs, while Carol was a talented writer and editor. 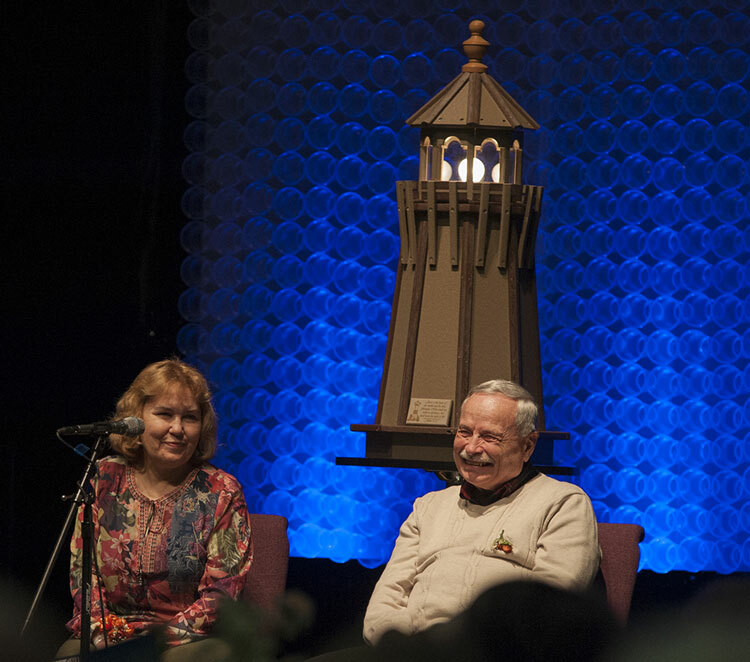 Les and Linda Smith in front of the lighthouse replica. Lester Smith is retiring on June 1 after 38 years of United Brethren ministry, and 20 years as pastor of Hillsdale UB church (Hillsdale, Mich.). Jim Bolich (right) has been appointed senior pastor of Mount Pleasant UB church (Chambersburg, Pa.) effective July 1, 2018. He had been senior pastor of Prince Street UB church (Shippensburg, Pa.) since 2002, and prior to that served in associate pastor roles at two other Pennsylvania UB churches–Franklin (New Castle) and Mongul (Shippensburg). He is also part-time Director of Ministerial Licensing for the US National Conference. 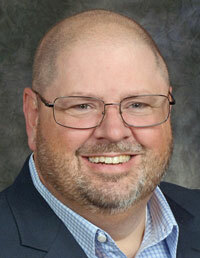 At Mount Pleasant, he will replace Dr. Ray Seilhamer, who is concluding a two year assignment as interim pastor. 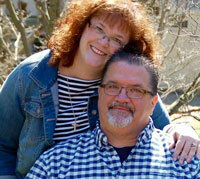 He and Ruth will be moving back to their home in Roanoke, Ind. Brad North was appointed senior pastor of South Scipio UB church (Harlan, Ind.) effective April 1, 2018. 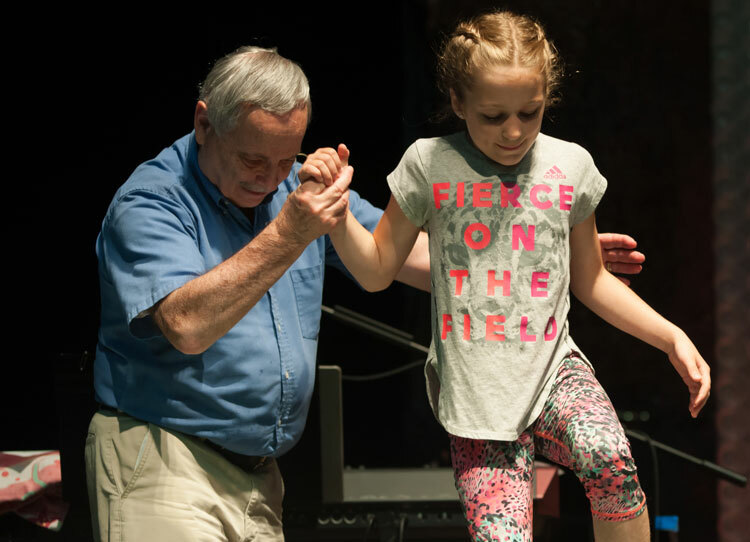 He had been in camp ministry since 1997, most recently as director of Camp Living Waters in Luther, Mich., since 2013. He replaces Ken Thompson, who had pastored South Scipio for two years. L-r: Josh and Sara Good, Les and Linda Smith, David and Jennifer Dakin. Josh Good has been appointed senior pastor of Hillsdale UB church (Hillsdale, Mich.) effective June 4, 2018. He has been in United Brethren ministry since 1998, serving in youth ministry until 2012, when he became senior pastor of Homefront UB church in Grandville, Mich.
Lester Smith is concluding 20 years as senior pastor at Hillsdale. Smith is retiring on June 1 after 38 years in United Brethren ministry. During that time, he served at four different UB churches in Michigan–Pennfield (Battle Creek) 1980-1982, Maple Hill (Grandville) 1982-1987, Richfield Road (Flint) 1987-1998, and Hillsdale since 1998. He has provided leadership in a number of roles within Michigan Conference and at the denominational level, including assistant chairperson of the Executive Leadership Team. David Dakin has been appointed senior pastor of Homefront UB church (Grandville, Mich.) effective June 11, 2018. He had been associate pastor of Jerusalem Chapel UB church (Churchville, Va.).